Crabs stuck in bottle caps and plastic six-pack rings feature on this Hawaiian shirt made from recycled plastic, by Spanish designer Adolfo Correa for Corona and Parley for the Oceans. The shirt was created for World Oceans Day by beer brand Corona and non-profit organisation Parley for the Oceans, which has previously created footwear and swimwear from ocean plastic in collaboration with Adidas and Stella McCartney. From afar, the Paradise? 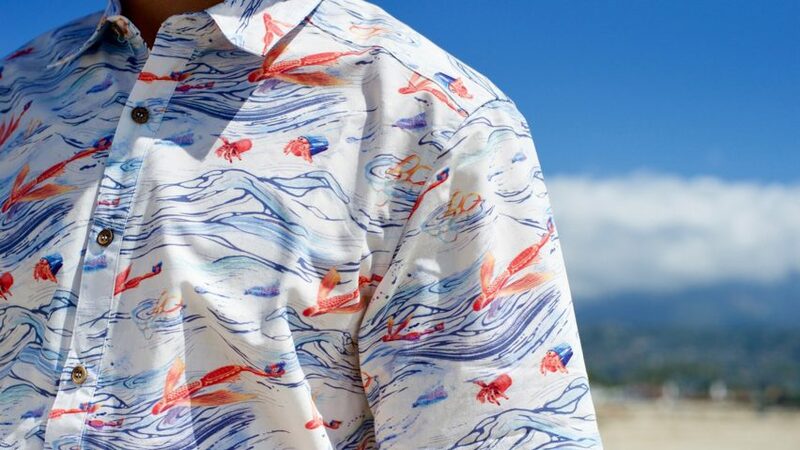 Shirt, designed by Correa, is a classic Hawaiian shirt featuring waves and fish. On closer inspection, however, the shirt is dotted with plastic objects found on the beach and sea, like toothbrushes and plastic bottles, "to represent the fact that the issue at a distance is hard to see, but pervasive up close". "As a brand that is synonymous with the beach, we are seeing the destruction of shorelines and oceans up close," said Felipe Ambra, Global VP of Corona. "Our ads usually showcase paradise the way we assume it to be, pristine and beautiful, but today it's increasingly hard to find a beach without plastic." "Through our work with Parley, we hope to reverse this trend. This World Oceans Day, Corona wants to remind the world that we all need to protect our beaches to continue enjoying them," he explained. The limited-edition shirt is available in three colours and is made from plastic that has been collected by Parley for the Oceans from the open ocean, islands, shorelines and coastal communities. As well as the shirt, Corona commissioned creative agency W+K Amsterdam to create an alternative version of their This Is Living campaign posters, featuring sandy beaches littered with rubbish – as opposed to the clean beaches usually portrayed in its campaigns. The agency also built a large billboard in London's Old Street from a thousand kilograms of ocean plastic with the intention of reminding passers-by on the problem of plastic on UK beaches. Waste plastic is a growing concern among both environmentalists and designers, who have taken action to help raise awareness of the problem and proposed a variety of solutions. Earlier this year Parley for the Ocean and Corona, established a fundraising platform called Clean Waves, which seeks to recycle plastic from the ocean into consumer products. Swedish homeware giant IKEA has revealed plans to remove all single-use plastics from its product range by 2020, while the Indian government has committed to banning the material from the country by 2022. Elsewhere, two Australian designers have created a floating rubbish bin that filters litter from marinas, while a 20-year-old inventor proposed a 100-kilometre array of floating barriers to help the cleanup effort.